Son of the late George Marshall Wilshaw and of Mary Emma Wilshaw, of 18, Arkwright St., Burnley. Express and Advertiser, December 29, 1917. The many friends of Second-Lieut. Eric J. Wilshaw, R.F.A., who was very seriously wounded in the eyes, chest, and throat by a gas shell, and was also poisoned on October 31st, and has since been lying dangerously ill at hospital in France, will be pleased to hear he is improving and has been removed to a hospital in London, and there is every reason to hope that he will ultimately recover. The shell fell through his dug-out, wounding four of the occupants and killing one. Three have since died, thus Second-Lieut. Wilshaw is the only one of the five to survive. His mother was sent for by the War office, and proceeded to France, where she remained in attendance on him for five weeks. Second-Lieut. Wilshaw has been on active service since August, 1914, having served in Egypt and Gallipoli, and received his commission in February last. On proceeding to France, in March, he was appointed to a battery of the R.F.A., and has since seen much heavy fighting. He is the second son of Sergt. Major G. M. Wilshaw, R.A.M.C., also on active service in France, and was educated at Alleyn's College, Dulwich, S.W., and at the Higher Grade School, Burnley. Before the war he was employed at Cairo Mills with a view to later taking up some branch of the manufacturing business. 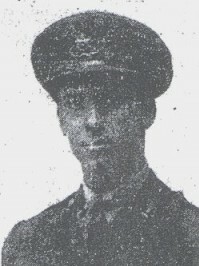 His elder brother Corp. L. R. Wilshaw, M.T., A.S.C., was killed in an air raid on September 3rd.